The Honda College Grad Program is here to help College Place and Kennewick graduates — or soon-to-be-graduates — can get $500* toward the purchase or lease of their first set of wheels. If you’ve just thrown your cap in the air, you’ll be eager to thrive in your first job and start building your new life, and Honda has created the College Grad Program to let you do so in style behind the wheel of a new vehicle. Why Take Advantage of the College Grad Program? Honda has one of the finest selections around. Whether you need a stylish and flexible subcompact like the 2018 Fit or a sharp sedan like the 2018 Civic, there’s sure to be something to meet your needs. Getting a new car used to mean saving for years, but Honda is making is easier by offering $500* toward any 2018 or newer vehicle when you finance or lease with HFS. One of the first steps for College Place and Kennewick drivers is simply to come down to the showroom here at Walla Walla Valley Honda to see what’s available. Don’t worry about pushy salespeople: our team works on salary instead of on commission, so they won’t try to persuade you to buy something that’s not right for you. That’s just one of our Principles of Awesomeness! 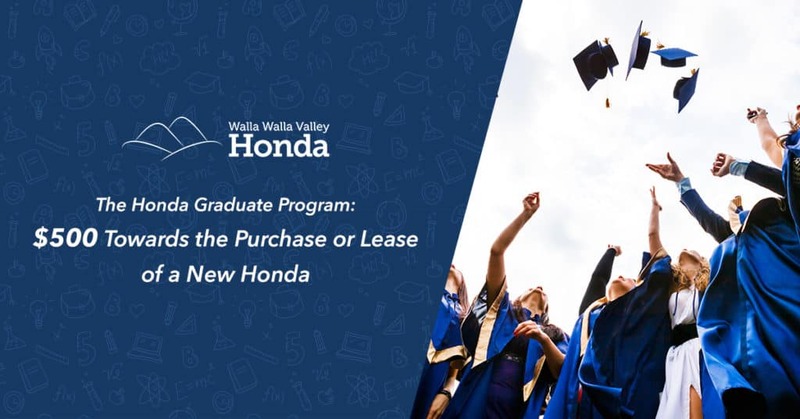 The Honda College Grad Program has been designed to help new grads get a new vehicle, so make sure you come to Walla Walla Valley Honda in College Place, WA soon — this offer is only available through March 31 2019, and we hope you’ll take advantage of it! *Offer ends 3/31/19. See dealer for complete details. *The Honda Graduate Program is limited to the 48 U.S. contiguous states, Alaska and Hawaii. For well-qualified customers who meet Honda Graduate Program criteria, subject to approval by Honda Financial Services (HFS). Bonus offer applies toward any new 2018 or newer model year Honda when financed or leased through HFS. Only offered at participating dealerships. Only one $500 Honda College Graduate Bonus offer per vehicle. LEASE: $500 applied towards the cap cost of vehicle. Monthly payment and total due at lease signing are calculated after $500 reduction. Cannot be combined with Zero Due at Signing Lease program. PURCHASE: $500 applied towards down payment. Offer not valid on Honda Certified Pre-Owned Vehicles or used Honda vehicles. Offer valid through March 31, 2019, and may be terminated at any time.